Reverse osmosis system basics used to prepare purified water in pharmaceuticals by water purification. Reverse osmosis is the best-known filtration method and it is widely used in pharmaceutical water systems. This process is used to remove the particles including ions from the water. Reverse osmosis system contains a semi-permeable membrane that allows passing the water and rejects the contaminants. In most of the reverse osmosis system, it cleans the membrane itself and the process is known as crossflow. Reverse osmosis is capable to remove the salts, sugars, proteins, dyes, bacteria and other particles having the molecular weight greater than 250 daltons even viruses. 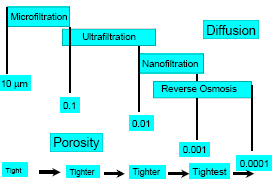 The reverse osmosis process requires a force to pass the water through the membrane known as driving force. This force is applied in the form of pressure with the help of pumps. Contaminates of water are separated and collected in a tank known as the concentrate. Generally, the RO system recovers 70-80% of feed water and this efficiency decrease as the membrane is used. The membranes are commonly made of cellulose acetate and they are having a very small pore size from ranging from 0.01µ to 0.0001µ. Generally, in water purification systems, RO membranes are used having the pore size of 0.0003µ. No microorganism can pass through this membrane.This membrane is fitted in a hollow tube where the water is passed from outside to the inner side of the rube through the membrane. The filtered water is collected from the hollow tubing and the remaining water containing water contaminants is collected separately.